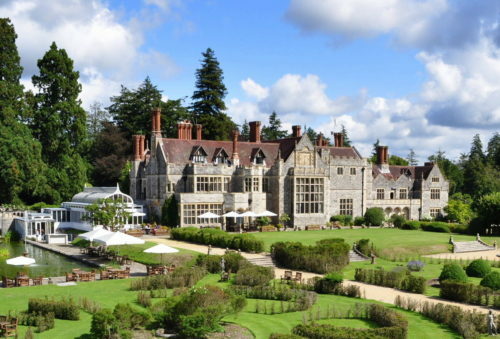 With beautiful surroundings and a blend of Tudor and Gothic architecture, Rhinefield is the most perfect fairytale wedding venue. It is also the ideal setting for an indulgent break and an inspiring conference venue for meetings, team building or product launches. Downtime means the chance to take in the great outdoors we have on our doorstep, whether its pony trekking, long walks in the forest or a day trip to the sea. The hotel has 50 bedrooms including three feature suites, an outdoor pool and a small health suite. The 2 AA Rosette fine dining Armada restaurant is perfect for romantic or celebratory meals and The Grill offers a less formal setting with views of our ornamental ponds. We also offer private dining options for special occasions, including our renowned room inspired by the Alhambra Palace in Spain. The Armada is a 2 AA Rosette restaurant in the New Forest. The location, surrounded by forest but also near the sea, gives access to some of the country’s finest produce. There can be few more dramatic backdrops for a candle-lit meal or special celebration: the intricate Armada frieze above the original fireplace was carved over a period of nine years from a single block of oak four feet thick. Give your meal that added sparkle with private dining in one of our unique rooms. The inspired Alhambra room has to be seen to be believed. 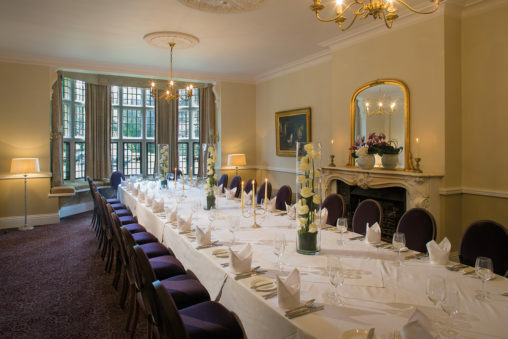 We offer an abundance of room types for conferences, banqueting or a special meal with family and friends. You will enjoy a private dining room and a dedicated service team who will deliver the bespoke menu you create with our head chef.